The growth offlowers needs a stable environment. If you love your flowers and care about them, choose our greenhouse. 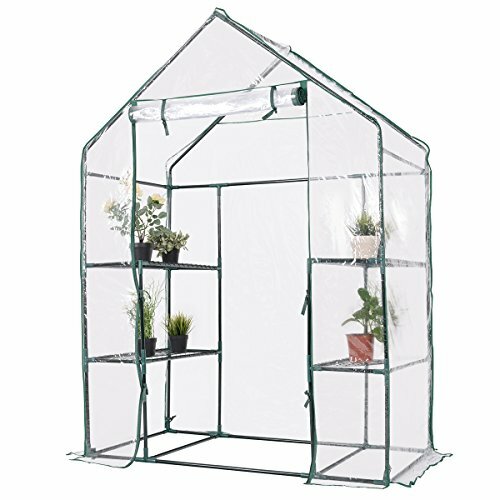 This portable, walk-in greenhouse is perfect forplants protection and growth. Flowers in it can enjoy sunbathing and grow healthy in cloudy, in snowy or in other conditions. In addition, the lovely and beautiful flowers can also take a fresh breath in it. Our greenhouses are themost affordable products online. Don't hesitant to buy it! 【Enough Space And Sturdy】  6 steel mesh shelving, 2 pieces more than those with 4 wired shelves, provide better drainage and ventilation. High quality, heavy-duty powder coated steel framework. 【Transparent PVC cover】  Made of transparent polyethylene, completely water proof. It allows more sunlight to keep plants warm and be good for the growth of plants. 【Zippered Middle Walk In 】  With Zippered Mid walk-in design offers enough growing space for large size plants, and with zips for easy access and ventilation. 【Mini Greenhouse】  Can be used both indoors and outdoors. Flowers in it can enjoy sunbathing and grow healthy in cloudy, in snowy or in other conditions. It's portable to move. 【Convenient In Assembly】  The Giantex Mini greenhouse easy to assemble and the all required accessories are included. You can quickly assemble the item and use it in a clear and easy-to-understand manual.